OUR MEMBERS The WSBMWRiders are a diverse group of men and women from all walks of life with one major thing in common... we all love to ride motorcycles, especially (but not exclusively) BMW motorcycles. As a member, you’ll have the opportunity to meet and ride with many others who share your passion for riding. We invite you to join this group of like-minded folks who make up our local BMW family! WSBMWR was formed in 1972 and has grown from its original four charter members to today’s roster of almost 200 households, some with two or more riders. We have a yearly rally, campouts, organized rides, monthly meetings and many other events. This website includes photos and event detail along with many other useful links for riders. Use the links on the left to explore the site; I recommend that you start with the "Events Calendar" and the "Special Events" before (naturally) moving on to "Online Signup" to become a member! WSBMWR is a charter member of three national organizations: The BMW Motorcycle Owners of America (MOA Chapter 104) The BMW Riders Association (RA Chapter 101), and the American Motorcyclist Association (AMA Charter 2845). The Club was the first chartered BMW motorcycle club in the state of Washington, and has members residing in Washington, British Columbia, Arizona, and California. Our main purpose is to encourage and support the enjoyment of riding! MEETINGS Breakfast meetings, each followed by a ride, are usually held the first Sunday of every month from September to May (in June, July and August, we assume you won't want to take time off from riding to go to a meeting!). Meetings occur at various locations in the Puget Sound area, and feature presentations by industry professionals and safety experts, as well as reports by Club Board Members and event coordinators. Snow Camp, a regional event sponsored by South Sound BMW and the BMW Riders Association, held at the Sahara Horse Camp just outside Mt. Rainier National Park every January. A winter getaway weekend to Long Beach WA, normally in February, is an opportunity for members (who often come on 4 wheels) to meet and commiserate, and maybe fly a kite. Rain Run, which kicks off the “official” riding season in April with a ride to Manzanita on the Oregon coast. There's great riding to and from Manzanita, and varied activities while there - dinner, breakfast, sometimes a campfire on the beach. May and June usually feature Club campouts, hosted by a club Member or held at a campground. These meetings are often held in Eastern Washington to take advantage of the warm weather. 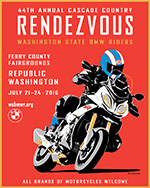 The riding year peaks with the Cascade Country Rendezvous, our annual rally, held in July. The rally typically draws about 200 riders who share and enjoy good food, fantastic riding, field events, an awards ceremony, camping (or a nice hotel) and always great camaraderie. The "Turkey Run" ride after the November meeting ends with dinner at a member's house, where some lucky rider gets a free Thanksgiving turkey. IN ADDITION to these events, many members participate individually in charitable rides, “runs’ sponsored by other groups, and other regional events such as the toy run, the Veteran's Day parade in Auburn, and the occasional vintage moto events. Ideas are always welcome on how to help the community and enhance motorcycling’s image. All events are posted on the Calendar.